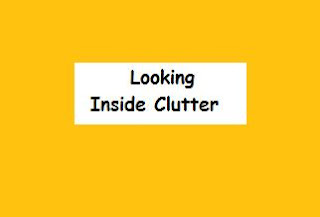 Even the related words for clutter tend to clutter ! Today I so wanted to write about dreams, but my own personal clutter won out. I even received several emails about clutter.........so clutter it is. I truly shouldn't be writing this blog entry because my entire office is a mess. For the past week I've been working on a variety of projects, most of which required pulling my filing cabinets apart. As I searched for things I needed, I was struck by how disorganized my files had become. When did this happen? It seems to me that I had re-structured them not all that long ago.........or was it? Once we begin to notice clutter it tends to turn up everywhere. I walked into my office closet & there it was........every shelf & drawer. Piles of things that I have little recollection of placing there. How is it that I can be with these piles every day, yet not see or remember anything about them? I noticed that I was actually afraid to look around the rest of my life with my eyes of the day. What if I found this everywhere? Could I possibly be that lost in my life.......AGAIN? My memories went back to the late 80's when I had a clutter-wake-up. We were living in the Albany, NY area & my husband was re-locating to Oklahoma & I was to stay to market the house & finish up some work projects. Our sons had just left for college & even the dog had run away. Yes....I was alone with myself, something that I preferred not to experience. During those years my bingeing issues were big & unresolved, usually waiting around any corner to take over my life. To complicate matters, my husband suggested, quite strongly, that I clear out the house. I was stunned by this because to me, the house was just fine. It was clean. I was a good homemaker. We needed all the things that were there & I certainly wasn't about to get rid of the things I'd collected & loved. Why did I own these? I seemed to remember that I collected them for leftovers. Quite honestly, I don't like leftovers & certainly these were the most depressing containers I'd ever seen. I remember tearing... What had happened to me? How widespread was this pattern of disorganization & not-remembering? I opened a few kitchen drawers & realized that they contained things that I didn't even recognize. I had no idea what to do with some of the gadgets that lived there. I began to feel surrealistic, like I was a visitor in my own life. Since I was working in gerontology with Alzheimer's patients at the time, I began fantasizing about perhaps being in the early stages. Not very funny. For some reason my bingeing came to mind.........yes, it was like my entire life & home were on some sort of bender. By this time I knew I was on to something, intuition perhaps & I had a slight twinge of awareness that this was going to be a very important something. My inner mind suggested that I make some spot visits to other rooms..........no matter where I went, the same was waiting for me. My goodness. Think further.....And if this was the case with my home, what about the other parts of my life? I thought about my work, my hobbies, my goals & my dreams....my relationships. Were they also full of clutter & detachment? What couldn't I see? What was I missing? Of course, this idea added to my earlier uneasy feelings about being alone & being afraid of myself, but sometimes when fear mounts, it does reach it's peak & thank goodness, that is what happened for me. I reached the top of the fear- mountain & now I could sense the release. I was willing to see & so now I was free to take care of things. How does one begin when there is so much clutter, confusion & disorganization? Here are some things I did. They may sound a bit excessive, but I needed a plan to set me free. 1. I rented a copy of Ghandi. I knew that he had gotten down to one loin cloth & his glasses. I thought he would be a good mentor for me. I watched it twice ! 3. I made a folder for each room & listed every area separately, including each drawer, closet, shelf, etc. When I began a room, I had to stay with it until it was finished. Of course, some rooms took me a week or so. The basement took me several weeks. What I mean by staying with it was that I didn't allow myself to do a drawer in the kitchen & then one in the bedroom. I noticed the tremendous desire to do this........it seemed far too related to my troublesome behaviors of the past & so it was disallowed. 4. I made myself actually touch or handle everything I owned. Then I decided it's category. And yes, this was very time-consuming, but as I look back, it was a very important rule. I learned much from this exercise & it translated into changed behaviors that follow me to this day. Rarely do I purchase things I don't really love or need. I used to buy more compulsively & so this was a tremendous benefit for me. I learned to appreciate what I had & of course, realized that I had far too much. I didn't need all of these things to live happily. In fact, they had gotten in my way. 5. I allowed myself one job & two hobbies. One hobbie had to be a physical activity & the other one could be whatever I wanted. The reason for this rule for me was that I had tons of hobbies. I started things, but didn't finish them. I'm a person who is interested in just about everything. I love to knit, sew, embroider, do needlepoint, do beadwork, do crafts, etc., etc. As for work, I had several jobs going, yet I wasn't truly doing what I wanted to do. I came to realize that unless I stopped this binge behavior, I would never come to do what I really wanted to do. In other words, I was pushing my subconscious mind to focus hard. My mind had gotten lazy through the years & so my goals had wandered away. 6. I rewarded myself each day with something non-tangible. I had forgotten how to do this & so for me this was another adventure in getting to know myself better. It took me about 3 months to complete this task. It was truly a journey to find myself & to get to know myself, perhaps for the very first time in my adulthood. I did end up reviewing my relationships & actually ended a few friendships that truly weren't. I shortened my Christmas card list..... & enhanced my most important relationships. So, how long did this last? Well, at the beginning of this blog I mentioned that I was surrounded by clutter. Obviously, this is an ongoing process, but it is very rewarding. I do the house thing every year or so........or when it speaks to me. Once you have done the big process, more frequent messages are received. If you are motivated to do this, don't be surprised if you get some big releases & creative break-throughs ! I'm expecting one once I clear out this closet! We all have beliefs and behavioral patterns that work for us and those that don't. It helps to image them as plants for plants know all seasons and they can, indeed, be helped to grow and change. Some plants have both positive and negative aspects. Others are completely positive and some completely negative. We spend a good part of our day planting and weeding, often not awake for our inner gardening work. Working the time-line allows you to see where old beliefs were planted, as well as where and how behaviors were developed. Some of these are in the past, but many are actively being planted in the future. Yes, you are planning and planting your future on many different levels. This can be either good for you or not so good! As young children we develop volumes of coping mechanisms and behavioral patterns. Some of them follow us right through life. Some help and some impede. Some we learned from our parents, other mentors or teachers and some came by way of experience. We often can see our parents in ourselves as we become older and wonder if history has to repeat itself through us. Some of these inner behavioral programs work well for us and can be seen in our successes. There are, however, some that do not work well and often some that hinder. It is important for us to know that we can alter any behavioral program simply through the tools presented here. Interactive Awareness and Interactive Self-Hypnosis give us the means for going into these past files. We can then re-edit or reframe memories and associated programs, so as to make them healthy and useful to us in our present and future life. Re-framing beliefs or memories or any mind programs is just like deciding that a particular photograph would look better in a different frame, and then actually changing it; only frames for mind programs are those of perception. You choose to see your mind program differently, through “new eyes.” Suppose that you have a memory or mind program that is framed in anger or distrust. This is how it is stored in your subconscious mind, so whenever you review it consciously, it will come up framed in anger or distrust. In fact, the way the subconscious mind works, every time it comes up the frame will be stronger in perception. Now suppose you have a mind program or memory file about managing an addiction framed in failure. I’m sure you get the idea! Now we are spending time assessing and locating areas for concentrated attention later on. Take some time to deeply relax, in fact even deeper than before. Perhaps close your eyes after reading this, knowing that everything shown to you will be useful in your recovery. Each day of your life you are presented with learning experiences. Some appear pleasant and others are not, but all are learning experiences. Significant people may have or currently be demonstrating anxiety, panic, depression, compulsive or obsessive behaviors to you. You may find yourself mirroring these or wanting to, perhaps later in the day. Go to work on your time-line. For example, notice if s anyone demonstrated addictions to you in the past. Addictions and related behaviors travel through families of origin and extended social circles. Also look for specific emotional teaching or patterns that may or may not work for you. All hold importance for now, as well as for your future. Call in your librarian and spend some time looking through the shelves for any history of anxiety and panic, depression, obsessive-compulsive tendencies, as well as treatment or known triggers. These are very connected to addictions and stress-related issues. Remember the octopus and the tentacles? While there are physiological connections to the aforementioned, there are also triggers and you learned these somewhere and probably from someone. Think of the world as a great big school where you begin your formal schooling at birth, continuing along until death. Every experience you have is an actual learning experience. Every person you meet, or that attracts you in some way becomes a teacher of sorts. All of these experiences are stored in your subconscious mind and the inner librarian knows where they are. This information will become very useful later on, so take your automatic writing pen and welcome the inner communication. Remember to be patient with the process and if nothing comes off the pen, simply wait a moment and then move on to the next section. You may find yourself receiving this information later on in a different quiet moment. Two weeks ago I fell off the top of my desk while changing a cartridge in my fax......a rather silly thing....OH put down the silly word.... I'm not about to hide behind myself.....it was a rather stupid thing to do. As a result of this extremely bad moment of judgment, my life took quite a few turns, some more major than others. I couldn't walk, I couldn't put weight on my left leg, I couldn't stand, I couldn't sit, I couldn't lie down. It was quite amazing to have absolutely no where to go to experience even a moments relief. And so, I couldn't go to work, nor cook or do anything else. On a somewhat lesser note, I became "unblogged" which may sound like a small thing, but it was not. Writing my blog is part of my life, perhaps not one that sustains me in any financial way, but it is meaningful never the less. My life changed in many ways over the past two weeks. I'm a different person now. Accidents change people. Active recovery changes people. Nothing about it is fun, nor would I care to repeat any of it. HOWEVER, it has been an excellent learning experience & in a way, I'm a better person for falling off my desk. I'm now out of the acute phase & into what is known as recovery.. Recovery is an interesting word. Truth be known, we are always involved in recovery. Either we are recovering actively from something, or we are involved in designing a recovery plan for some part of our work or life. As a nursing administrator I've worked on many potential disaster or recovery committees. As a wife & mother, I do the same at home. Recovery begins long before any episode that may or may not happen. We have a ongoing mind folder that is labeled disaster plan or recovery plan. Some of us do understand this folder very well, perhaps because we have actually lived through disasters & found the weaknesses in our programs. Those weaknesses became our motivators.....we listened well, accepted our errors & became creative in not only correcting, but making things much better than before. In case you are wondering, I now have a mind folder for changing the ink jet in my fax machine. To be sure, the plan is very different from the one I carried out. It does help to make mistakes. This is how we get better, but. some lessons are definitely harder than others. The people in who were hit by Katrina & now Rita know plenty about this. When all is said & done, these people will be very different in many ways. Children become adults overnight, seeing & experiencing things that are not meant for their eyes or psyches. Trust is lost, perhaps never to be gained again. Laughter, abandonment & pure joy will be more difficult to find & perhaps feeling wrong for a very long time. This is all part of the grieving process, some of which will never end. So, what do we do in order to find & accept a new normal? If you have faith in a Higher Power, turn to that for solace, as well as for direction & motivation to get moving again. Take your mountainous problems & break them into smaller, more manageable pieces. For me, it is one baby step at a time. I must put my old life on a back burner & work towards my new normal, knowing that once I've achieved that, then I'll be ready to go up a few pegs, hopefully nearer to my old normal OR even better. I stop moaning about what I can't do & do what I can. I trust in my body. I've taken good care of it for a very long time & now is the time to reap the benefits of that work. If you are not caring for yourself at optimum levels, begin today. You never know when you might do something stupid without thinking. Work on paying attention to what you do. We are all vulnerable. Don't let the levies remain weak. I was just listening to the news about the levies in Galveston & I couldn't believe my ears. Some of them are cracked & very vulnerable! How could this have been ignored. Hurricanes happen.........accidents happen! Be prepared. Take good care of yourself & your environment. Fight, fight, fight. Don't be a quiet observer. You may live to regret it. Once you fall off the desk, the rest is history. Lucky for me my levies were in good condition from years of excellent self-maintenance. Yes, I'm injured, but I'm going to recover & hopefully to be much better than before. Victims usually don't happen overnight. Take time today to check in on yourself. Where are you weak? What do you need to do? What will you do today? Do it now. It's the holiday season & not the time when most people want to think about finishing what's been started or starting what needs to be finished. While the New Year is touted for resolution-setting, the idea of making resolutions has lost it's popularity, probably because everyone is sick & tired of hearing about losing weight, exercising, stopping smoking or whatever needs to be addressed. Right now my private practice is very quiet, but come the 1st of the year, many will lift their weary heads from their sleeping pillows & stumble into my office. Personally, I like beginning again. In fact, I tend to practice "beginning" just about every day. There is really no need for a new resolution. It's more like an ongoing personal cleaning up or clearing out. If I look carefully, underneath the disorder I can sense my desire & willingness to pick up where I left off. Through the years I've been able to set a gentler, friendlier restart button. Perhaps it's because I avoid the resolution word & hype, so the fear of being criticized for failure or not achieving is less. After all, it's not a resolution or anything. It's simply something that was left unfinished & perhaps no one will even notice that I've restarted whatever it is. Truth be known, very little gets finished in life.... at least in my life. For me that includes managing my weight, minimizing my pile of magazines, completing my writing assignments, my love for icing, or having my home dust free & the bathrooms completely clean. I'm so glad to know this because then now I can stop efforting & striving over so many things. Perhaps I can even begin enjoying them. It's easy to see why I had spent a good part of my previous life bogged down, almost to the point of burnout. With my new definition, I am free to simply relax, picking up any challenge where I left it untended, no longer racked by shame or guilt. No need to hide anymore, from myself or the judging eyes of others. What a relief ! 1. It's a good idea to put some things down for awhile. As I mentally walked through the areas of my life, noticing what was left unattended, I couldn't help but notice that some areas were doing better on their own since I left them alone. I'm not surprised, acknowledging that I have a tendency to beat things to death, or smother them with attention if they are not responding in the way I think best. Sometimes I can become breathless in the process, even if there is no aerobic activity involved. Talk about efforting ! 2. There are 24 hours in a day & that includes eight that should be dedicated to sleep. No one gets more or less. I'm just like anyone else with owning too much to do. On the days I can't breathe I know I'm in trouble. For some deep & hidden reason, this a big learning curve for me. I have some ideas about why this is, but what is truly important is waking up to it & getting practical. I don't have to look far to know what has to go. It's vital for me to be ruthless in my clearing & cleaning, not just with my possessions, but with the intangibles as well. This is never easy, but it is incredibly rewarding. Even throwing away socks with holes can seem like a break-through moment. 3. Choosing what is truly important to me can focus my mind. Just like cleaning & clearing is vital, so is deciding on exactly what I want. It's amazing that we can have so much of so many things & still not have what we want. How does this happen? For me, it's always been about not clearly defining what I want. In order to do this, it's necessary to truly slow down, to clear, to be still & then to begin to define. When I work with myself I utilize automatic writing. For my patients, it's easy to go into the workshop of the mind with guided imagery, enter the metaphor, perhaps shopping for the details. In both scenarios, the subconscious mind joins in the creative goal building & then sets a plan of action. 4. I can always be healthier. Eating correctly for my body needs, excercising, managing my addictions & a host of other areas can all benefit from beginning again. Exploring ways to do this always triggers additional areas to present themselves. This morning I was having a look at my nutritional areas when I heard from my skin department. When we become purposefully still, either in meditation, hypnosis or automatic writing, the messages begin to flow, but never in a way of becoming overwhelmed. The subconscious mind understands the need for balance or homeostasis & takes one towards that. If anxiety is in the way, it simply means that you have to release & go deeper down to pass that obstruction. 5. I don't have to be perfect. I just need to be present. Growing up in a critical household, I developed many automatic mind programs about the need for perfection. This was one of many that kept me locked in my personal prison for decades. For me, it is very important to begin the mangement of these automatic programs over & over again. This is how they weaken or diminish. Some of mine that could do with some refreshing or clear eyes include approval seeking & self-doubting. Do I have others? Of course I do. I'm human. But, once again the subconscious mind is kind & prefers balance. When we take the initiative to work in one area, the others will simply follow suit. So, enjoy all the holidays....a perfect time for reflection & an opportunity to wake-up & enjoy the fresh air that surrounds new beginnings. To help you along, here's a sample mp3 of a very popular program that I've written, recorded & produced called Affirmations for Inner Winning. This will give you a head start in working with your own subconscious mind in many new ways. This particular mp3 or CD has three tracks or sessions. You can order the entire program on my website. Who would say "no" to progress? Truth be known, I know plenty of people who would & who do. Many are private patients of mine & while I might "tut-tut" at that & enjoy some good old finger-pointing, that very finger often turns around, pointing right back at me. As for the life-game of mindSCRABBLE, as I inwardly giggle at my own disorderly behaviors, my subconscious mind is busily mind-etching those even deeper. If I was paid for cluttering, I'd be quite wealthy. Of course, I deny cluttering & as for hoarding.....well now, certainly not me. My issues with all of this go back to early childhood. My father died when I was three & I learned to make every attempt to keep what was mine. This was my little attempt at building a secure life. While it does help to know the origin of issues, it certainly doesn't diminish the decades of closet & drawer stuffing. I've become so good at this that I can clutter just about anywhere & with just about anything. Yes....I would be quite wealthy. I've learned that letting go is a good thing & so I go through emptying & releasing episodes. My main reasoning is that I've come to realize that prosperity doesn't flow into cluttered space, so I must release if I choose to prosper. It also helps to find things. Just the process of clearing is creative & it never surprises me what catalysts sit in that last bulging file. Ordering disorder is a very emotional experience for me. I truly have issues with letting go & today I decided to write about these, instead of just noticing them. It is true that my things do bring me joy. I love all sorts of things including my scraps of paper. So, is there something wrong with that? After all, I'm basically a good person. Just because I feel connected to scraps of paper, does that make me a loser of sorts. Of course not, I tell myself. Don't be so dramatic. I do want to be able to let go & release with more ease. I've noticed that whenever I go through periods of cleaning, clearing & letting go, that it does become easier. In fact, it actually begets itself. So, I guess the goal needs to be to practice more often. Is it possible that I might actually become good at this & even learn to like it? Oh....where to begin on the subject of anxiety. Why do I feel that I must write about this today? This morning I was doing some automatic journaling for myself & my own anxiety issues came off the end of my pen, completely uninvited, but obviously wanting to roost on my desk. After writing yesterday's blog on the theme of the day, I couldn't help but hope that anxiety was not going to be today's theme. Since I've been practicing automatic journaling for decades now, I know to trust it & that means to just go with the flow without judging or fear. For those of you who aren't familiar with this type of journaling, I suggest that you give it a whirl. It's quite simple. Open a new journal or notebook that is dedicated to this task only. I use a spiral notebook......I actually have two sizes, one 5 by 8.5 & the other 8.5 by 11. I prefer to write in the larger one because there is more space, but sometimes I like to pop the smaller one in my briefcase & take it on the road with me. To help you along, here's a sample mp3 of a very popular program that I've written, recorded & produced called Automatic Writing. This will give you a head start in working with your own subconscious mind in many new ways. This particular mp3 or CD has three tracks or sessions. You can order the entire program on my website. When working daily with Automatic Writing, put a decent amount of time aside for yourself. For me, that means at least 15 minutes & preferably more like 30. Sometimes I'll get to the office a bit early, specifically for this purpose. Next....open the journal & have your pen ready. Don't use the computer for this. The mind will gift more to you if you put the pen to paper. Relax deeply, just for a few minutes. I call this settling in..........& then begin to write. Don't be concerned about sentence structure, grammar, etc. Just let the pen flow. Write whatever comes. Stay out of judgment. If the mind sends ramblings, so be it. Write them.... & if nothing comes, write that as well. Keep going for the length of time you have decided to write or fill the amount of space you have decided to fill. Keep to the discipline. And once you have finished, put it away. Here are some journal entries of mine from today - see how many themes you can spot. Look beyond the obvious. Remember, this is coming directly from my own subconscious mind. Also, look for the affirmations; the positive mind programs that were given to me through the end of my pen. My first patient arrived. I've been seeing her for over four years. She was only fourteen when she first walked into my office. She sat in the pink chair & hid behind her hands. She only weighed 90 pounds. I've known her at 65 pounds & now, while she is only 102 pounds, she is different. She leaves for college next week. I'll miss her tremendously, just like a daughter. I even tear as I write this. She's very anxious about so many aspects of college. Her parents are anxious, imaging all the worst. It's been more than four anxiety-filled years for them & they are rightfully frightened. But today she sits before me & we discuss her dorm-room decor & her new room-mate who is coming with the refrigerator. Simple, but important things to a girl who has made such a journey. Changes & anxiety coupled together. Fear of the known & unknown. Fleeting little thoughts having the power to turn our blood to ice, often not understood by others who might even laugh at our dilemma. Babies....oh grow up ! Feelings of walking alone on new paths, excited but frightened just the same. Our thoughts connecting up with other past experiences, some good & others not so good. What kinds of memories will we be making? Oh, why can't things just stay as they are, even if they aren't very good? At least they are familiar! 1. Anxiety & excitement are very close in their chemical composition. What's important here is the labeling. It only takes 1/200th of a second to change the label from a fear state, to a positive exciting state. 2. You have the choice & the power to diminish all fears & all thoughts that are fear-related. Take out your re-framing tools or use the pie-cutter. The latter is a releasing tool for diminishing a portion of a fear or anxiety that may present itself as too big to manage. 3. Emotions are like children that wear tee-shirts with their names on the front. You are not your emotions, but you are in charge of them. You have the choice & the power to diminish any & all emotions that are not benefiting you & you have the choice & the power to invite in or enhance any & all emotions that do benefit you. Remember to keep your eye on your mind-assets & utilize them to their fullest. Don't let them get rusty from disuse! 4. Managing yourself & your life is fun! The better you get at a task, the better for you in the long-run. This is how champions are made. If you feel the desire to run & hide behind an old, impotent behavior pattern, wake-up & come forward instead. Meet the bully-factor & disassemble it. Observe it losing power as you gain power. Pay attention to the power of your mindWORDS. They are all coated with chemicals that change the outcomes of your entire mind & body. The more positive-task-orientated you are, the more power you will harvest.